"Mrs. Darling is pristinely presented by Hannah Jane McMurray...McMurray's Darling is cut from a Mary Poppins cloth, practically perfect even in longing for her lost children." ​"As Mrs. Darling, Hannah Jane McMurray is sweetly poignant, and has the most nuanced performance of the evening." "The BCM production’s biggest asset comes with a single performance -- Hannah Jane McMurray as Phyllis Rogers Stone...She carries herself with poise, sings with authority, and, best of all, suggests that her hard shell is just a ploy to hide her character's vulnerable interior." "I cannot recall when last I saw such a wedding of actor and role." 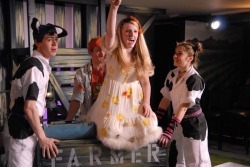 "Hannah Jane McMurray as Hen and A.J. Holmes as Calf were a riot." "As Hen, statuesque Hannah Jane McMurray easily mastered showy dance routines." "McMurray stays gently and firmly in character as Bat Boy's adoptive mother. Her devotion has reality."